Astronomy Professor William Herbst studies the star, KH 15D. 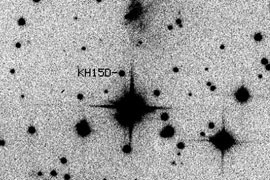 Pictured are images of KH 15D out of eclipse (left) and in eclipse (right) as taken from Wesleyan’s observatory. It’s 3 million years old and 2,400 light years away, but a distant star discovered by Wesleyan researchers has given insight into how our solar system may have formed. NASA wants to know more, and has given William Herbst almost a quarter of a million dollars to keep looking. This month NASA (the National Aeronautics and Space Administration) awarded Wesleyan Professor of Astronomy William Herbst a $216,000 grant to continue his studies of the star, KH 15D, and other emerging stars and their possible link to the creation of our solar system. 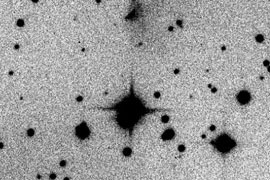 The grant for Herbst’s proposal titled “Synoptic Studies of T Tauri Stars in Nearby Clusters and Associations” will span three years. It was approved by NASA’s Origins of Solar Systems Program and is one of only 39 proposals of the 94 submitted that received funding. Related resource: Animation of KH 15D.